For each object (a printer, a user, or a user group), you can allocate a printing quota. 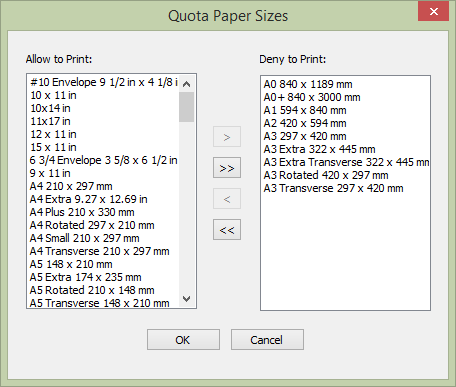 When the quota is reached, all the following print jobs will be handled according to the quota settings. Select the menu item User->Printing Quotas to view or edit the printing quotas. 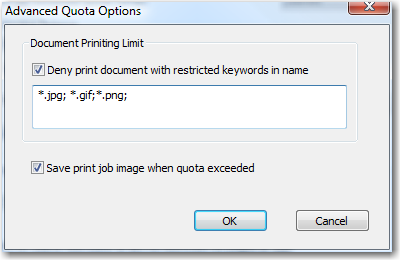 When setting a printing quota for an object, you need to specify how to handle print jobs if the quota is reached. 1Removed – Remove all print jobs. 2Paused – Put documents sent to print in a print queue and pause their printing. Limit printing with a balance. For each object, a quota defines a balance that can be used to print documents. When printing a document, its cost is calculated based on the printer’s cost settings. IMPORTANT: If you have not set any printing cost for the printer, each document’s cost will be zero. Essentially, it means that printing cost limits will never be used. Document – the maximum balance of quota is one document. Daily – the maximum balance of quota is limited by the total cost of documents printed in one day. Weekly – the maximum balance of quota is limited by the total cost of documents printed in one week. Monthly – the maximum balance of quota is limited by the total cost of documents printed in one month. When printing each document, the total cost of all documents printed within the period specified in the quota is calculated. If the total cost of print jobs does not exceed the maximum balance of quota, the document will be printed. If the total cost of print jobs, including the document being printed, exceeds the quota, the print job will be removed or paused in the print queue. A printing quota with the maximum cost of $10.00 per document has been set for a user. The Removed action is set to be performed if the quota is reached. It means that the user is allowed to print documents, each of which has a printing cost of up to $10.00. If the balance of quota is exceeded, any print job of that user will be automatically removed. The total number of such documents is not limited. A printing quota with the maximum cost of $100.00 per week has been set for a user. The Removed action is set to be performed if the quota is reached. It means that in one week, the user is allowed to print documents whose total printing cost is up to $100.00. If the balance of quota is exceeded, any print job of that user will be automatically removed. In the Balance of cost field in the editing dialog, you can see the total cost of documents that can be printed in the current period. Limit printing by the number of pages. You can also limit printing by allocating a quota on the number of pages. The triggering rules are similar to those of the cost-limited printing. Instead of document printing costs, the number of pages printed is counted in the balance of quota. You can combine cost-limited and page-limited quotas, or use them separately. If you set both cost and page limits, every print job will be checked for meeting each of the two criteria independently. Limit printing for each print job. Prohibit color printing – only black-and-white documents are allowed to be printed. Any color document will be removed from or paused in the print queue. Allow duplex printing only – a document will be printed only if two-sided printing is specified. Prohibit document printing based on paper size. For printers that support a few paper sizes, you can allow a user or a user group to print documents with a specific paper size only. To do that, you need to create lists of allowed and prohibited paper sizes. For example, if the quota prohibits printing on paper sheets of the format A3 or larger, a document will be printed only if the format A4 or smaller is specified. Prohibit printing of documents with specific keywords in the filename. You can also limit printing of documents whose filenames contain certain keywords. To set this kind of limit, click the Keywords button on the Quota tab. When specifying multiple keywords, separate them with ; (semicolon). The following keywords have been defined for a user: jpg; jpeg; gif; png; bmp. The Removed action is set to be performed if the quota is reached. If the user tries to print a document named SomeCoolPic.jpg, the print job will be removed. The option Save print job image when quota exceeded means that any document sent to print after the quota is reached will be saved in the O&K Print Watch database. The sequence of applying a few quotas when printing a document. When printing a document, O&K Print Watch looks for and applies quotas in the following order: Print server → Printer → User’s groups → User. If even one quota prohibits printing the document, it will not be printed. Handling the quotas of the user’s groups. A user can be a member of one or more user groups, each of which can be allocated its own printing quota. 1If even one of the quotas allocated to any of the user’s groups allows printing the document, it will be printed. For example, the Domain Users group has a quota of 100 pages per day, and the Accounting group has a quota of 500 pages per day. A user who is a member of both groups can print up to 500 pages per day. 2If one group’s quota prohibits printing based on certain property, and another group does not have such prohibition, the user who is a member of both groups will be allowed to print the document. For example, printing color documents is prohibited for the Domain Users group, but not for the Designers group. A user who is a member of both groups can print color documents. IMPORTANT: You can apply a group quota to all members of the group. For example, if you create a “100 pages per day” group quota and turn on the “Apply to each group member” option, each member of that group will be able to print up to 100 pages a day. If you do not turn on that option, all members of that group, taken together, can print no more than 100 pages a day.